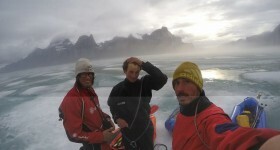 We had the first news about the ascents of Luca Schiera (Ragni di Lecco) and Andrea, in Oman in November 2013, through this simple e-mail: “Hello, everything ok? 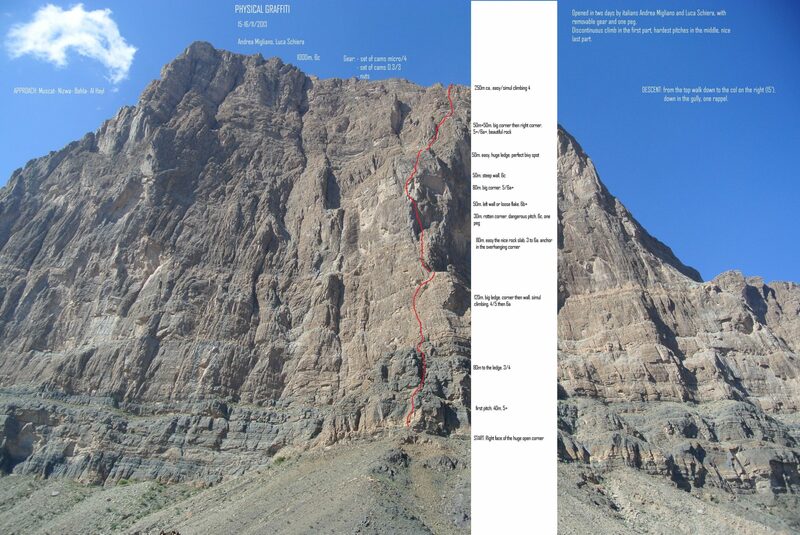 If you’re interested: we opened a new route on Jebel Misht, a huge mountain!”. Sometimes technical grades and environmental difficulties are not so important. 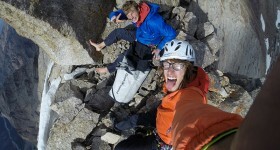 What matters is the adventure, the style, the spirit and the energy of this young guy when he goes climbing a mountain. 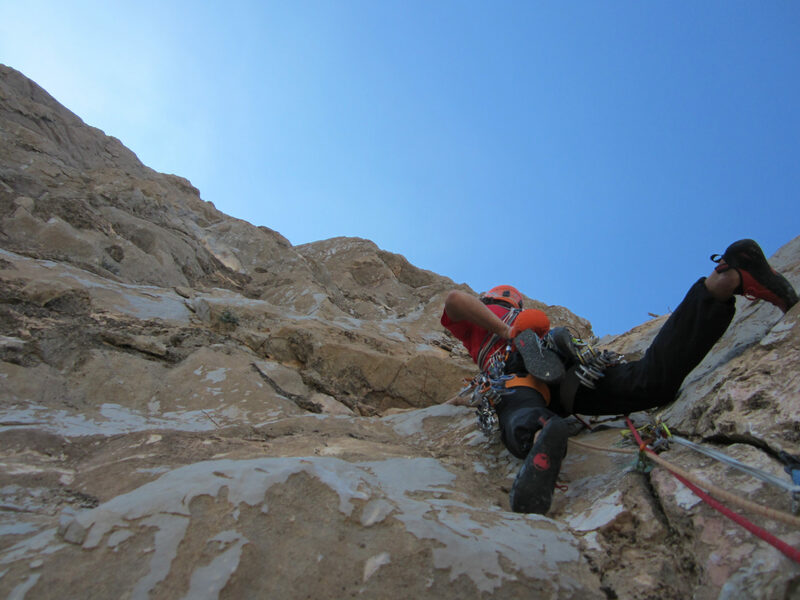 What follows is a more detailed report of his climbs on the harsh Arabian summits. Andrea proposes me to go in a warm place; it’s September and this year I already spent more than four months around in the mountains. We just know each other, but it looks a good idea, why not? We decide for Oman, where it seems there is still a lot of rock to climb. An emotional flight at sunrise, over the Alps, brings us to Zurich, then Dubai, eventually to Muscat. We arrive there in the night and have no idea of where to go, so we spend the night lying down in a bar, after drinking a questionable milk shake. The following day, with the sunshine, we clear up our minds. We have a long journey looking for food and a rental car. 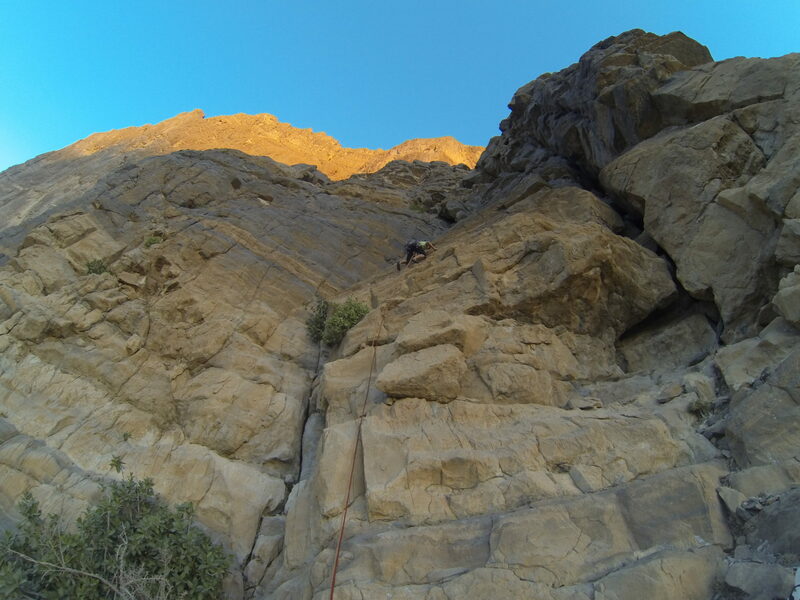 That same evening we’re off to the most known wall of the country: Jebel Misht. While hanging around in the night under the moonlight, it looks like the profile of a mountain can be similar to ours, we stop in a dirt road, set the tent and collapse inside. I wake up all sweaty and with some dizziness I search for the shade…nice start! At least the mountain is right. I regain consciousness and get ready to approach the wall; we go up slowly trying to find a line on the right side. Looking with the binocular we find a logic line in the center of the wall and after studying with the camera we’re convinced of that possibility, there’s only one pitch which is unclear but it looks doable. We leave all the gear at the base and go down. The next morning we start at 4 am, and at dawn Andrea is already climbing the first pitch. I belay carefully and I even wear the helmet. 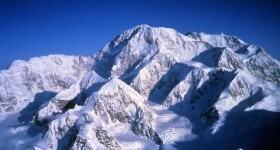 The line we had imagined, little by little, becomes true under our hands, we simul-climb many meters until a big ledge. Andrea starts again on the hardest part, but he gives up and asks me to go on. I put on my climbing shoes and start climbing a very compact slab that leads under a big overhanging corner; I set up a belay as good as I can, but it doesn’t look really bomber and, without loading it, I belay my friend. I start again fully concentrated, the rock is chossy, it keeps on breaking and for several meters I can’t protect, I pull each hold as delicate as I can, I clean and find a spot for a bad cam, I climb up in stemming and place three bad protections which i link up and equalize, then I get to a small pulpit where I can rest one hand…the exit is close, but there is still a passage on loose rock. After going up and down several times I ask my friend for the hammer and put the only peg of the route. Despite on the belay my friend feels the rock shaking, the peg is good, I trust it and climb out, mentally drained. After a few pitches Andrea takes back the lead, until we thought it was easy, indeed we find another vertical wall with sharp rock and loose blocks. Underestimating everything I go again whit the shoes unfastened and pulling as hard as I can the few solid holds; I go out on a big ledge, almost in the dark, out of time. While it gets dark we look for a good place to bivy and find some dry branches to light up a fire. It’s dark and cold (but not too cold). We lay down close to the fire and we try to sleep under a thin soft shell, but we can’t, we notice some clouds and something unexpected happens: it rains. We look for a small shelter and think on how to go down, but luckily, meanwhile it stops. We light up the fire again and don’t try to sleep anymore; we spend the hours talking and eating the last bar. 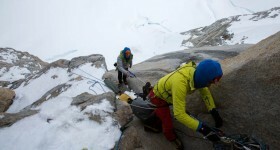 With the heat of the sun we continue on the last sharp pitches and climb up the final easy part. We go down by foot at the beginning, then we enter a couloir and with some down-climbing and some rappels we arrive down at the moraine in a hideous heat. We arrive back in the tent after 34 hours (14 of which spent bivying). After a few rides with the car, some canyon and an attempt to climb, we go for a wall seen from the road, bivy close to the base and at sunrise we start on the first part which is surprisingly good. With a few long pitches we arrive under the headwall. This time the rock is compact and full of features, some hard pitches, some less and in a few hours we’re 700 meters higher on the summit of the Al Hamra Towers. We go down on the opposite side; we use the hammer for a nut and a peg for the rappels. In Khasab we’re welcome with a light rain; we just got there by boat and have a tour on the peninsula. Everything is different here: less warm, less desert, bigger chapati. We hang around in the night and camp on the road close to the coast. I feel rolling while sleeping, when Andrea wakes me up, the sheet of the tent is bombed by the rain and I can barely hear him. “No big deal” I think, I put my hand on the ground, and realize that I’m floating on my mattress; we’ve the feeling on flowing with the tent. In the panic we manage to get out of the tent and find ourselves in the middle of a river of mud, which has formed in a few minutes and leads to the ocean. The engine of the jeep starts on the first try and we manage to put everything on (including the mud), we spend the rest of the night in a safer parking lot. The following day we drive on the only road looking for a compact and steep wall, we find it inside a valley. 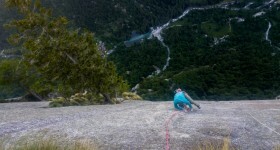 I start on the first pitch in a corner and belay from a ledge; when Andrea is below me a hold brakes, he screams and I immediately see what happened. I retrieve him quickly and try to treat his dislocated shoulder. Our trips ends up here…we spent the last day at the sea!